DUMBARTON lost out on what would have been a deserved draw or possible victory when Livingston scored a late winner at Almondvale. 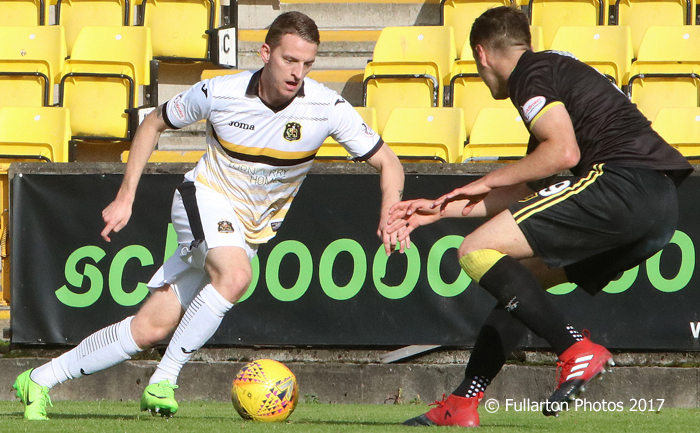 DUMBARTON lost out on what would have been a deserved draw or possible victory when Livingston scored a late winner in front of a 960 crowd at sunny Almondvale. Sons showed plenty of attacking spirit in the opening spell, forcing the home side on to the defensive. But it was Livi who went one up on 19 minutes. Former Son Alan Lithgow did the damage, powering in a header from an in-swinging cross. From then on in the first half Dumbarton were under the cosh, with only superb blocks by Chris McLaughlin and Dougie Hill preventing further loss. Sons came out with determination after the break, looking most threatening from set plays. On 61 minutes Christian Nade crashed a header off the bar. It bounced agonisingly on the line and away. With 15 minutes left, Sons grabbed a deserved equaliser. Tom Walsh (oictured )motored down the left and delivered a ball which squeezed past Livi keeper Neil Alexander. Dumbarton went all out for a winner in the closing stages, but on 84 minutes Livingston stole the points when a ball into the area was not dealt with and captain Craig Halkett headed home for 2-1.